Airtel Monsoon Offer - Here are the details that how You Can Get 30GB Free 4G Data From Airtel. India’s largest telecom company, Airtel has announced ‘Holiday surprise’ offer for the next three months. The new offer goes by the name ‘Monsoon Surprise’. The offer is available now for Airtel postpaid subscribers. Airtel is right now India’s giant telecom company. 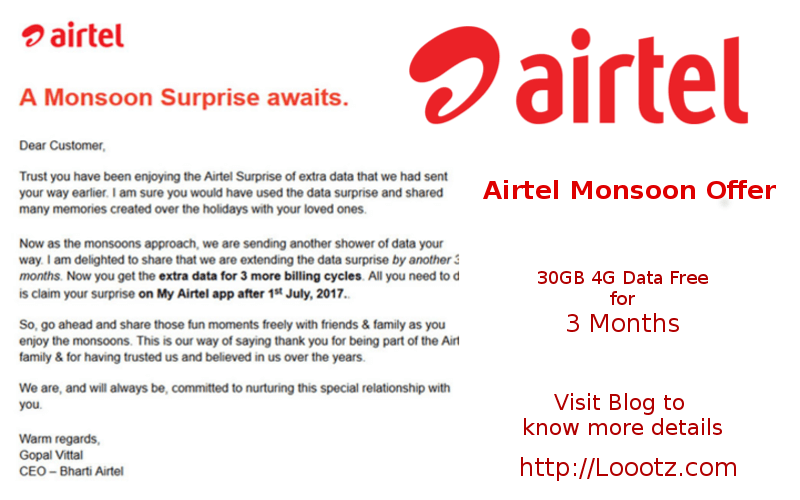 If you remember, a few days ago we have shared a news in which we have explained Airtel’s Monsoon surprise offer. The company had earlier decided to continue its previously announced ‘Holiday surprise’ offer for the following three months. The new offer goes by the name ‘Monsoon Surprise’. First of all, if you don’t have My Airtel app then download and install it from Google Play store. Now you will see a top banner which claims ‘Enjoy 30GB Data’, you need to click on that banner. Follow the on-screen process and check if you are eligible or not. If eligible, you need to download and install Airtel TV app on your Android device and then click on ‘Claim Free Data’ to activate the Airtel Monsoon offer for free.